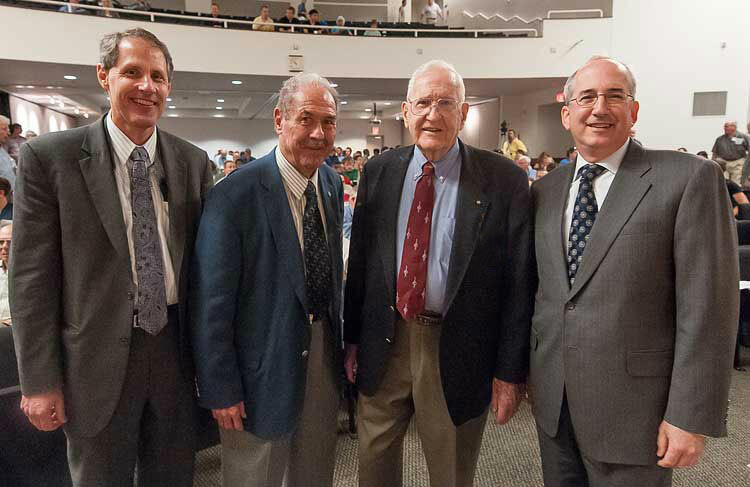 June 28, 2012 marked a special day at Argonne National Laboratory, when nearly 600 Argonne staff members had the privilege of hearing two of the pioneers in the nuclear energy field discuss the early days of their careers and their roles in Argonne’s nuclear energy legacy. Dr. Harold Agnew, retired director of Los Alamos National Laboratory and one of 49 people present on December 2, 1942 when the world’s first man-made controlled nuclear chain reaction was achieved with the CP-1 reactor, and Dr. Len Koch, one of Argonne’s earliest staff members and a designer of EBR-I, the first liquid metal-cooled fast reactor, spoke about their early work during “The Dawn of the Nuclear Age”, a Director’s Special Symposium held as one of the events to commemorate the 70th anniversary year of CP-1 achieving criticality. 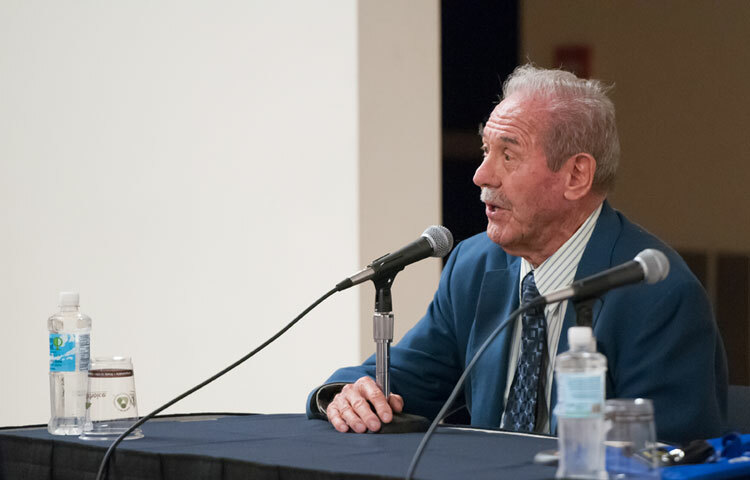 The symposium was moderated by Dr. Charles Till, a retired Argonne associate laboratory director who led Argonne’s nuclear engineering programs throughout the 1980’s and ‘90’s. Dr. Agnew painted a vivid picture of the challenges and rewards of working in Enrico Fermi’s group under strict security conditions and the complete faith all in the group had in Fermi’s analyses. He stated that no one ever doubted that CP-1 would achieve criticality, and when the moment came, those present acknowledged the accomplishment with little more than a subdued toast of chianti from a bottle provided by reactor physicist Eugene Wigner. This experimental work on nuclear reactors was continued in the Chicago area and led first by Fermi and then Walter Zinn, another member of Fermi’s CP-1 group, resulting in the formal establishment of Argonne National Laboratory on July 1, 1946. 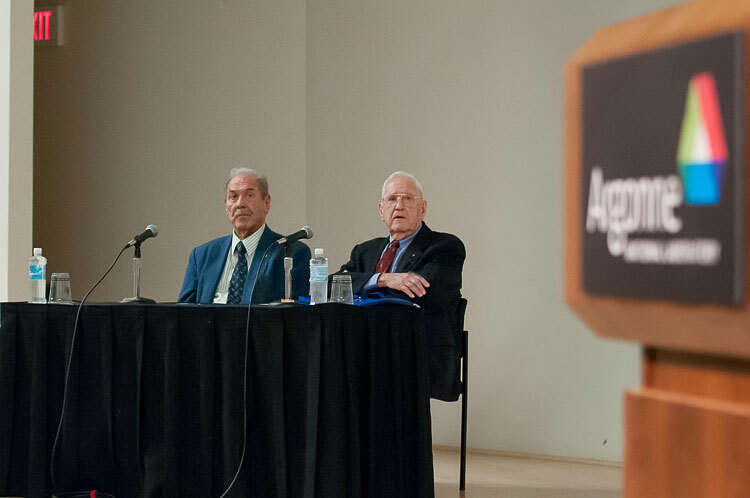 Dr. Koch described how much he enjoyed working at Argonne through the 1950’s and ‘60’s and contributing to many of the research “firsts” that Argonne achieved in the nuclear energy field and led to the foundation of the commercial nuclear power generation industry. His reminiscences about all that was achieved with EBR-I and how that work then led into Argonne’s design, building, and operation of EBR-II as a full demonstration of a fast reactor power plant brought Argonne’s nuclear energy legacy to life for everyone in the auditorium. 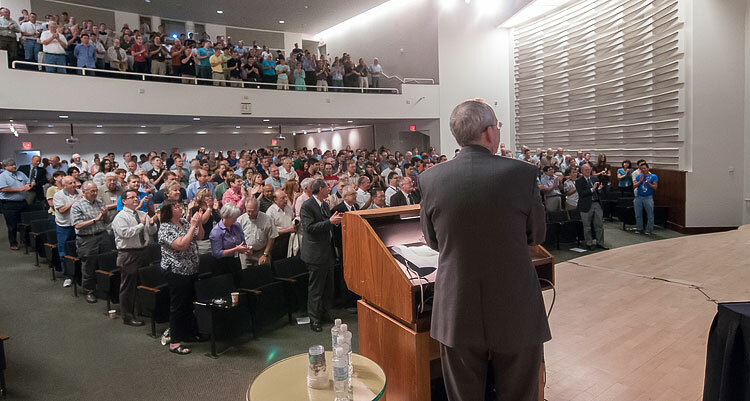 These engaging presentations prompted a number of questions from the audience, which showed its appreciation for both speakers by ending the symposium with a standing ovation. Argonne nuclear pioneer: Leonard Koch on YouTube (by Argonne National Laboratory) Leonard Koch joined Argonne National Laboratory in 1948. He helped design and build Experimental Breeder Reactor-1 (EBR-1), the first reactor to generate useable amounts of electricity from nuclear energy.